There is a lot of talk about uber clubs, tango shows, and performances at the Teatro Colon, but no one ever talks about bowling in Buenos Aires. Its the old standby that recalls twelfth birthday parties, wax-laned falls, and midnight madness. 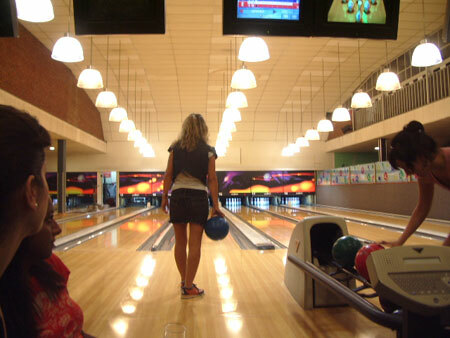 Paloko Bowling in Belgrano served up the pins and I tried to knock em down. Our game was delayed by league play featuring a team of Bolivians. We sat lane-side and watched the fast-paced action unroll right in front of us over litres of Quilmes and cenceros of peanuts. The Tuesday night crowd was young and thin (in corporal and density terms), distributed between the two floors and fifteen lanes. In addition to bowling Paloko offers pool. Games cost $7 pesos and the awesome shoes are gratis! Bowling rocks! I’ve been there this weekend but now games cost 14 pesos. Anyway, the sport is worthy! Soy un aficionado del bowling y estoy buscando por pelotas de bowling nuevas para comprar. Favor informar onde puedo comprar ? This page rendered in 0.607 seconds.